The recent Superdrag vinyl reissues really got me primed for the debut full length from The Lees Of Memory. Featuring both John Davis and Brandon Fisher from Superdrag, I was pretty confident this would be a killer record. 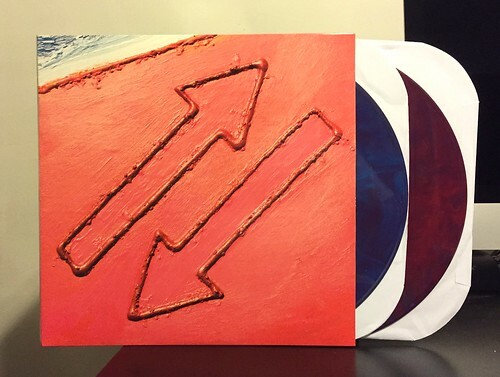 Though I missed out on their initial limited 7", I was first in line for the LP and managed to snag the very cool looking blue/red starburst vinyl, limited to just 100 copies. Musically, however, this album is something of a mixed bag. It boils down to this. The good songs are really good, but the bad songs are pretty bad. I'll expand on that a bit. This album is way too long. Clocking in at over 60 minutes and featuring NINE songs that are more than 5 minutes long, this record could have used some serious editing. Sure, when the band is relatively upbeat and rocking, songs like "Little Fallen Star" and "Open Your Arms" fly by enjoyably. But The Lees Of Memory get so bogged down in atmospheric swooshes and guitar layering that by the time I get to the seventh minute of "Reenactor," I'm just done. I can't say I've ever been a huge fan of really long songs or really long albums. 35-45 minutes has always pretty much been my sweet spot. There's nothing inherently bad about this Lees Of Memory album, it's just that it's too boring in places to be this long and still be enjoyable. I wouldn't write them off completely though. When this record shines, it does really shine. The band just needs to tighten things up a bit and not get so lost in sonic nonsense.